Science Catch-up. Could You Have a Wheat Sensitivity? 3. Should diabetics be wary of Paleo ‘hype’? 6. Meet me at Food Matters Live! A wheat sensitivity is not fun. The condition is associated with nasty gut symptoms like bloating, abdominal pain or diarrhoea – plus other things like fatigue, headache, anxiety, memory or cognitive disturbances, and leg or arm numbness. There’s no cure for it, other than avoiding wheat. The problem is diagnosis. Because currently there isn’t a medical test telling you exactly whether you have a wheat sensitivity or not. For the first time, the biological markers for wheat sensitivity (in non-coeliacs) has been discovered. This is big news. It means that a blood test may tell you if have them at levels indicative of a wheat reaction. They are signs of a systemic immune reaction. In this new study, the blood levels of both LBP and sCD14 were significantly higher in those with a wheat sensitivity. 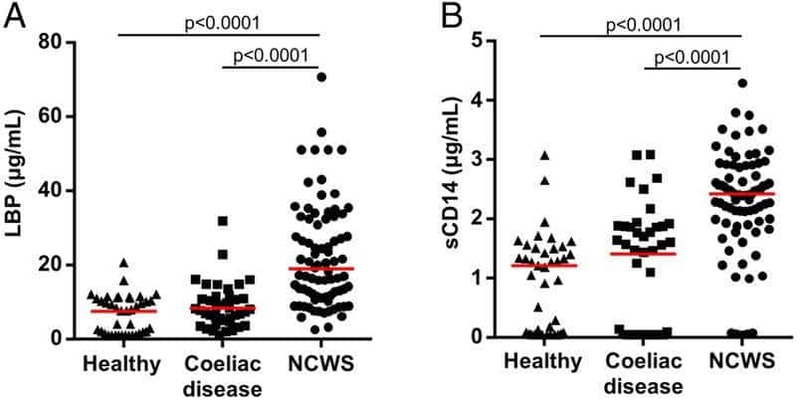 And I mean a LOT higher when compared with both coeliacs and healthy individuals eating wheat. In other words, not even coeliacs have that much of them from wheat. You can see that in the graph I included below. Note: If you’re non-coeliac but suspect a gluten sensitivity, there are other biomarkers you need to get tested for. You can learn about them and how to tell if you’re gluten sensitive here. 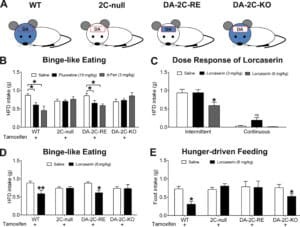 This study shows how a brain circuit (called serotonin→dopamine) inhibits binge eating. Serotonin neurons in the midbrain directly “speak to” dopamine neurons in the nucleus accumbens. This communication channel between serotonin neurons and dopamine neurons seems to be the missing piece to stop binge eating. When boosting brain serotonin content, dopamine neurons are activated, which inhibits binge-like eating. This makes sense, because previous studies showed that impaired brain serotonin signalling is linked to the development of binge eating in humans. In fact, binge eaters are found to have decreased brain serotonin. But when brain serotonin content increases, binge eating is supressed. Note: The serotonin→dopamine brain circuit is just one tiny piece in a massive puzzle. However, being a student with our advanced weight loss certification lets you delve so much deeper into this. Should diabetics be wary of Paleo ‘hype’? The “modern” Paleo diet from books and blogs recommends avoiding refined sugars, legumes, dairy, grains and cereals. Instead, it advocates for grass-fed meat, wild fish, saturated fat, nuts, vegetables, and some fruit. But the Australian Diabetes Society president is saying that patients with type 2 diabetes should be wary of the ‘hype’ about the benefits of going on the Paleo diet. He argues that there have been only 2 trials worldwide of type 2 diabetics on a Paleo diet. Both studies had fewer than 20 participants, and didn’t last long enough to draw conclusions on weight and glycaemic control. Note: While everyone keeps arguing about this, you shouldn’t. Most people don’t even know what Paleo humans really ate. In the Paleolithic era, there wasn’t even one single universal Paleo diet. Some regions were plant-based, others meat-based. So a better question is: what’s your own ancestry, genetics-wise? This can reveal a lot about your own nutritional traits. You may find some clues here. I love this little video. It’s quick (shorter than 2 minutes). It summarises 3 simple, science-backed ways to fall asleep, fast. No pills required. I have a quick question for you: Where are we getting MOST of our fattening, nutrient-poor foods from? Convenience stores? Perhaps vending machines? Possibly fast-food restaurants? How about cafés? Nope. According to this new study, supermarkets are the main culprit. Apparently 88.8% of us eat cookies, pastries, ice cream, cakes, popcorn, crisps, and sweets. Oh, and we mostly source them from the supermarket! Sugary drinks are also in the equation. Well, supermarkets provide foods in large quantity at lower price. And consumers respond to these price incentives. “Buy 2, get 1 free” – sound familiar? On a positive note, another new study shows how to direct shoppers to healthier food options. How? Using in-store marketing to promote fruit, vegetables and fresh produce leads us to spend a bigger portion of our same food budget on healthier options. So a bigger question is… which “invisible forces” influence product placement in supermarkets? Should this be regulated? Or is it our responsibility to plan our groceries in advance? Did you know? Earlier studies have placed the probability of unplanned purchases in grocery stores as between 42% and 93%. These purchases have been shown to be influenced by in-store marketing. I miss the Science Reports. They were ace. Thanks, Emma, I know you’ve got all of them :-) Our scientists are working on a new one as we speak, it’s about personalising your nutrition based on your genetics! oh brilliant, that sounds right up my street. Definitely our responsibility what we buy in supermarkets and shouldn’t be regulated. Planning in advance when shopping in Aldi or Lidl is easier because of the lack of BOGOF offers, just good prices.